A series of classic album covers including Mike Oldfield's Tubular Bells and Parklife by Blur has been issued as a set of stamps by the Royal Mail. Other well-known record sleeves to have been made into first-class stamps include Pink Floyd's Division Bell. The design on each of the 10 stamps shows a vinyl record coming out of its recognisable album cover. The Post Office said the issues had transformed each record sleeve into "miniature works of art". Julietta Edgar, Royal Mail's head of special stamps, said: "This issue celebrates this unique art form and some of its greatest examples." Thousands of album covers from the past four decades were scrutinised before the final 10 were chosen. The Rolling Stones' 1969 album Let It Bleed, which was chosen, features a cake on the cover which was baked by a then unknown Delia Smith. The artwork, and not necessarily the music on the album, was at the forefront of the selectors' minds. 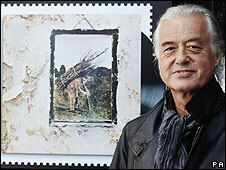 Led Zeppelin guitarist Jimmy Page, who helped design the cover for the band's album IV - now transformed into a postage stamp - helped launch the new issues in London. Page spoke about IV's cover, which features an old man weighed down by a bundle of sticks. "Almost 40 years after the album came out, nobody knows the old man who featured on the cover, nor the artist who painted him. "That sort of sums up what we wanted to achieve with the album cover, which has remained both anonymous and enigmatic at the same time," he said. Coldplay's A Rush Of Blood To The Head and Power, Corruption And Lies by New Order were also selected. London Calling by The Clash; Primal Scream's Screamadelica, The Rise And Fall Of Ziggy Stardust And The Spiders From Mars by David Bowie complete the list.